Discount Hotel Rooms in Glasgow - great prices, great quality! Searching for Discount Hotels in Glasgow? Visitors to Glasgow who are tied to a budget shouldn't have to compromise on quality when choosing accommodation. There are lots of great options available when it comes to finding a discount hotel in Glasgow. If you thought that you would have to stay in a hostel or miles away from the City Centre when visiting Glasgow, think again. The Sandyford Hotel in central Glasgow is a family-run hotel offering 55 well-appointed rooms at discount prices. We believe in delivering a top-notch service to all our customers and we don't cut corners when it comes to a warm welcome either. Every one of our bedrooms has free access to Wi-Fi and tea and coffee-making facilities. Our affordable B&B prices include a choice of continental-style or full Scottish breakfast. Best of all, when you stay at The Sandyford Hotel you will be right in the heart of Glasgow. We are located on Sauchiehall Street between the City Centre and the West End. Here you will find a wide array of places to eat and drink, shopping and plenty of evening entertainment. We are also a short walk away from the SECC and the River Clyde. A discount hotel in Glasgow doesn't have to mean being far out of town. The Sandyford Hotel is easily accessible by public transport or by car, with access to the M8 motorway. We are also conveniently located for travelling to Prestwick or Glasgow International airports. If you plan to take in a tour of Glasgow, you will find a hop-on hop-off Glasgow City Sightseeing bus stop just outside the hotel. Call The Sandyford Hotel today to find out about our special discount offers on bed and breakfast accommodation in central Glasgow. Our friendly reception staff will be happy to take your call. We also have discounts available on group bookings or last-minute bookings. Booking enquiries and firm reservations can be made by filling out the booking form on our website, too. 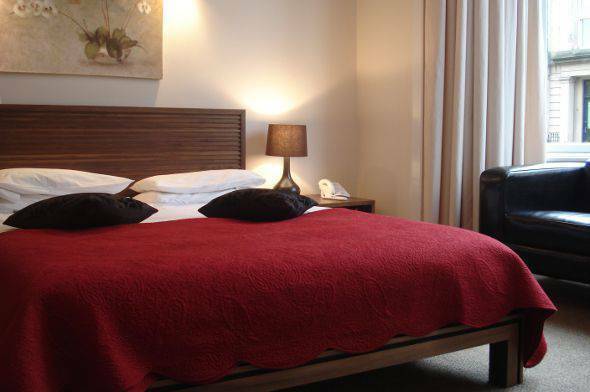 For visitors looking for discount Glasgow hotels, The Sandyford Hotel is the perfect choice.